Decided to linger another half day in Austin because I just didn’t feel like we’d found out all that was buried here, nor had I filled all of the empty five gallon sampling buckets I brought with me. 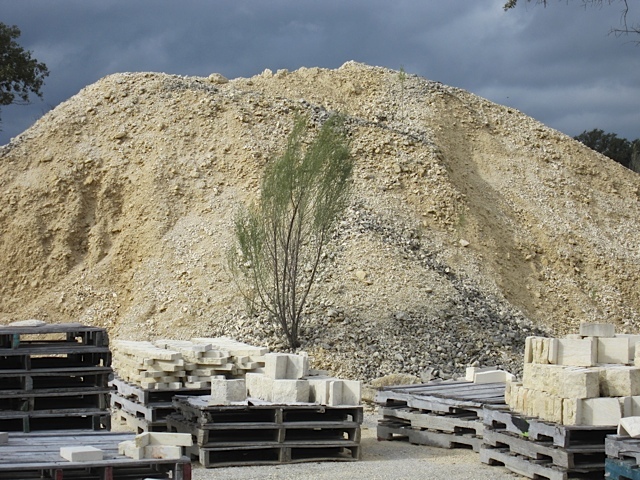 It’s a good thing we did stick around, because on a second visit to Texas Quarries, we hit paydirt. Paydirt is actually a gold miner’s slang for gravel with a high concentration of gold and other precious metals. I use the term here to add positive emphasis to my meeting with Robert Copeland, director of operations for thirty years. As Robert told me, he’s the third generation of plant operators since the quarry began extracting limestone from Cedar Park ninety years ago. What can I say? Robert knew his rock. The slurry piles were clean, well contained and almost pure white. Inside the plant, twenty ton gantry cranes moved twenty ton limestone blocks into position under the eight foot saw blades. Eighteen inch wide planing blades shaved the faces off of two- ton blocks like a chef shaves slivers off a chunk of chocolate. Horizontal honing tables polished four-foot wide slabs and edging saws cut the slabs into facing panels. Everywhere I looked, something exciting was happening to turn a piece of raw rock into finished products. I asked Robert how many people worked here. “Every one of them,” he replied. 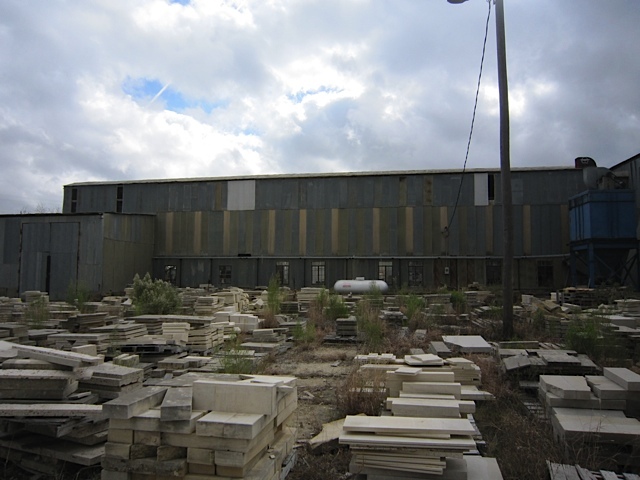 The Cedar Park quarry, now ninety years old, is played out. They truck blocks here from their other quarries at Liberty Hill and Lueders for processing. They sell finished limestone all over the country. Opus One, the Mondavi Rothschild winery in Oakville, California, is faced with limestone from Texas Quarries. When we walked by our truck, with the sample Watershed blocks in the back, he got out his pocket knife and tried shaving edges of the block. He took the point of the knife and picked at the clay fragments. “Harder than I thought,” he said. 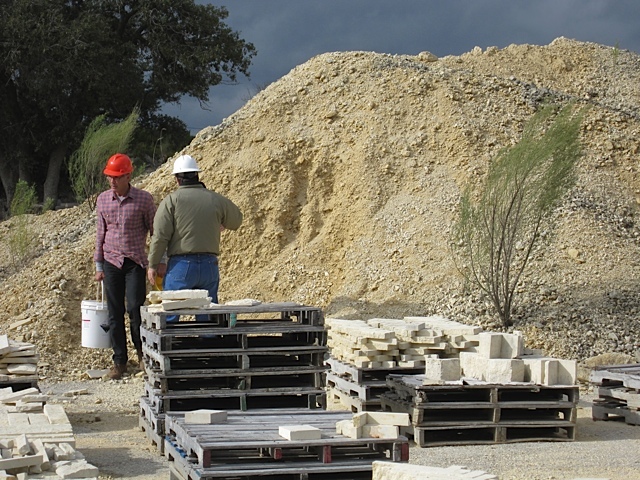 I left Robert and Texas Quarries Cedar Park with seven new things: four full buckets of sample materials diverted from quarry reclamation, three pieces of honed limestone, (cordova, lueters, and “sea floor”), and a renewed sense of the possibilities for making Watershed Blocks in Austin. At last we were ready - temporarily at least - to turn tail and head for California. We drove west on 290, through Dripping Springs, past Driftwood, Stonewall, Fredericksburg, Fort Stockton and into Marathon. We left the granite back on the LLano Uplift back around Enchanted Rock and once again entered limestone territory. The road cuts along I-20 are some of the best you ever saw. If only Cal Trans could learn to shoot a retaining wall that looked like the limestone cuts on the interstate in West Texas!